Eye exams and vision screenings are an important part maintaining kids' health. Pediatricians routinely check a baby or toddler's eyes during checkups to make sure they're healthy. By age 3 or 4, a child's vision should have also been checked to make sure he or she is seeing correctly. And around age 5, kids should receive routine vision screenings at school and/or their pediatrician's office. As children enter kindergarten and elementary school, good vision will become an important part of learning. 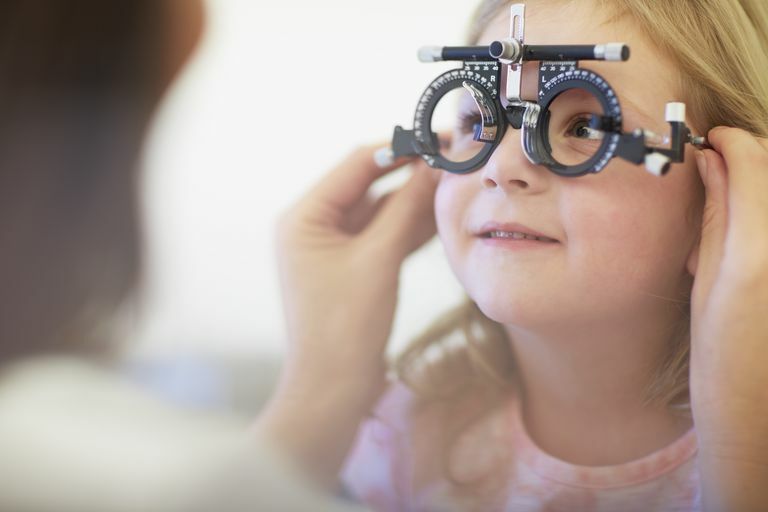 Here are some key facts parents should know about pediatric eye exams, and the important role they play in a child's overall health and development. Vision screening for kids isn't one and done. Because kids' vision can change over time, child vision screenings should be done at least once a year. Some vision problems, such as nearsightedness, may not emerge until kids are older, around age 8 or 9, and growth spurts can also contribute to a rapid change in vision. Many parents may not even be aware that their child is experiencing vision problems until a problem is detected by a vision screening. Vision screenings are important because young children often don't realize what is or isn't normal, and are not likely to speak up if they're not seeing as well as they should. The signs that your child may be experiencing vision problems can be subtle and can include squinting; tilting or turning the head to see something; eye misalignment (strabismus); complaining of headaches when doing visual tasks; inability to see things that are far away as well as peers/parents; trouble concentrating or fatigue in school; and having a persistent, unusual spot in his eyes in photos taken with a flash (a white spot, for example, instead of the common red eyes), which can indicate nearsightedness or in some cases, a more serious eye disease. Sitting close to the TV or holding things such as books very close to the face could also indicate a vision problem, but since these are common kid behaviors in all kids, parents should look for these symptoms in combination with the other signs that their child is having trouble seeing well, says Mae Millicent W. Peterseim, MD, a pediatric ophthalmologist at the Storm Eye Institute/Medical University of South Carolina. It is very important to catch vision problems early. Some conditions, such as amblyopia, or "lazy eye," are most treatable when caught at a young age, and are difficult to fix if it's diagnosed when a child is older, around age 7 or more. For instance, a child may have poor vision in one eye but see well enough with both so that the problem isn't detected; only a vision screening that tests a child's vision one eye at a time would detect such a problem. (Amblyopia is usually treated with glasses and sometimes patching.) "It's heartbreaking to hear a child say, 'I thought everyone could see better with one eye," says Dr. Peterseim. Once a problem is detected, a child should undergo a comprehensive eye exam. If a screening exam indicates a vision problem, a child will be referred to an ophthalmologist or optometrist for a complete eye exam. "At an eye exam, at the eye doctor's office, the technician will check vision and should do a test of depth perception," says Dr. Peterseim. The doctor will check to see how well the eyes track something and how well they move and focus on objects (looking at each eye independently by covering one first and then the other). She will also examine the retina and optic nerve and check the eyes for any signs of infection or disease. There are exciting new screening tests for children. "Newer instrument-based screening works well and can pick up problems in children earlier," says Dr. Peterseim. "A child looks at the device with a twinkling light and the machine detects abnormalities in a moment, like a camera, so minimal cooperation is needed." This method is a bit more expensive, but it's fast, easy, and effective. New AAP policy is recommending instrument-based screenings for children as young as 12 months old, says Dr. Peterseim. Eye exams are particularly important for school-age children. Children learn a lot visually in the classroom, and poor vision can have a negative effect on how a child does in school. That's why it's particularly important for school-age children to continue to get regular vision screenings, whether at school or at the doctor's office. Parents play an important role in protecting kids' vision. Follow up on screening test results and/or if you spot any signs your child may have a vision problem. Look for a pediatric ophthalmologist or optometrist, or a doctor who is comfortable with children and is experienced in caring for kids' eyes. For instance, kids tend to peek when asked to cover one eye, so a doctor should know to use a patch or cover an eye well during the exam. Doctors should also dilate pupils during an eye exam. "It is important that the child have drops to dilate the pupils to determine if he really needs glasses," says Dr. Peterseim. "Some doctors skip this step. If your child's eye doctor doesn't do this, a parent should ask, or go somewhere else."